Part of the cycle of Afro-Atlantic stories, curatorial axis to which MASP is dedicated this year, the museum exhibits, as of August 23, the most comprehensive show dedicated to the Lynch Fragments series outside the United States. Melvin Edwards is an artist and fundamental representative of African-American art - and, at age 81, will be present at the opening of the exhibition. Born in 1937 in Houston, Texas, Edwards appeared on the Los Angeles art scene in the 1960s, where he trained as an artist. In the same year, he won his first show at the Santa Bárbara Museum of Art, which launched him professionally. In 1967, he moved to New York and in 1970 became the first African-American sculptor to exhibit individually at the Whitney Museum of American Art. "This is the largest presentation of his work outside the United States, focusing on the series that is, in fact, the center of its production, the Lynch Fragments. This exhibition relates to global initiatives to disseminate the work of Melvin Edwards, who reaches the age of 80 as one of the leading sculptors in the world. Although known in the United States, with exhibitions in several museums, his work has only recently achieved international recognition, "says Rodrigo Moura, curator of Brazilian art at MASP and this exhibition. Edwards grew up in the segregationist racist environment of the United States and, dissatisfied with the largely white and elitist world of art, reflected in his works his engagement and militancy on issues such as race, civil rights, violence and African diaspora. The 37 works that make up the show at MASP are directly related to all these issues and to events that marked it. Shovels, axes, rakes and horseshoes evoke the rural backdrop of the southern United States, where the artist spent part of his childhood at his grandmother's house at the Fifth Ward in Houston, Texas, a community of Afro-descendants and Latino immigrants. 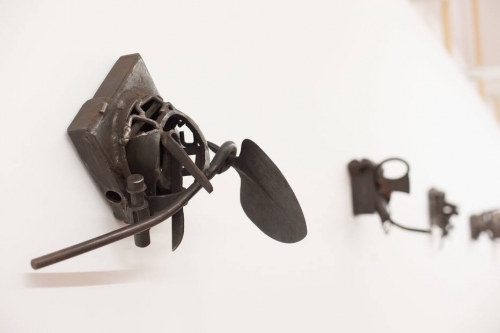 The Fragments displayed are small-scale wall sculptures that use existing metal objects - such as tools, knives, hooks and machine parts - welded together, creating works that lie on the border between abstraction and figuration. They perform a unique cultural synthesis between modernist solder sculpture and minimalist reductionism, also mentioning the memorable traditions of African sculpture. "The Lynch Fragments make up an extensive panel of African and African-American stories, highlighting notions of memory and autobiography. Initially, the works refer to episodes of racial tension within the framework of the Civil Rights Movement in the 1960s, and then plunge into a dialogue with diverse African cultures, something that coincides with the artist's own increasing presence on the continent, and culminates at the opening of his studio in Dakar, Senegal, in the 2000s, "adds Rodrigo. The beginning of the series in 1963 was the countless cases of racial violence in the United States. The title refers to the lynchings that historically persecuted and exterminated the Afro-descendant population after the abolition of slavery. His first Fragment, entitled "Some Bright Morning," (1963), evokes a history of racial violence involving a family in Florida. Its forms are aggressive and the meeting of the elements is marked by melted metal burrs, giving an unfinished character to the material. Other historical events that took the year 1963 are important to understand Edwards' production context. Among the emblematic facts is the iconic speech by Martin Luther King Jr., which brought together more than 300,000 people in Washington, known mainly for the passage I have a dream. The so-called March for Jobs and Freedom marked the apex of the civil rights movement of the Afro-descendant population and turned the fight against discrimination into a national cause (and no longer restricted to the south of the country). Living in Los Angeles, Edwards was also marred by riots in the Watts neighborhood, which marked a turning point in police violence targeting the African-American population. In 1973, the artist returned to the series, creating new works around the racial conflicts that he experienced while living in New York and during the Vietnam War. The year 1978 marks the beginning of the last phase of the work. At this stage, Fragments are increasingly related to African references, including languages, regions, characters and events, and to encompass specific African diaspora situations in the Americas. His visits to Brazil in the 1980s inspired him to make the work Palmares (1988), which mentions the legendary quilombo in the centennial year of the abolition of slavery in the country. Since 2000, he has held an atelier in Dakar, Senegal, where he has produced sculptures in partnership with local craftsmen and artisans. Edwards also taught metal welding in several countries, giving workshops and mentoring a younger generation of African sculptors.